Lumber isn’t perfect. We all know that. And somewhere along the evolution of our woodworking endeavors, those imperfections in wood start to drive us nuts. That’s when we start to get an itch in our checkbooks and start fishing around for a jointer. The new 6″ Jointer Planer from Ridgid was designed in response to customer comments, according to Paul Eckhoff, the new product development manager for the company. The three things customers said they wanted were: a more stable base, better sawdust collection and a dual bevel fence. So he and his team designed the new Rigid Jointer with a 1 HP motor to handle more wood per pass. For example, the new more powerful motor can even handle a shallow rabbet in one pass. The sawdust collection was something they spent a lot of time on, says Paul. Because the nature of the sawdust from a jointer is significantly different, the dust extraction is very important. The chips from a well-tuned jointer tend to be large, fluffy and prone to clogging just about any dust chute. In the old design, Ridgid had a complex chute system consisting of six pieces and about 40 screws. By simplifying it down to one piece and 18 screws, explains Paul, it dramatically reduces the things shaving can get caught on. His group also tried to add a degree of accuracy to this machine, especially with the dual bevel fence. “With a dual bevel fence, it’s hard to get the angle just right and to get a scale that’s very accurate and visible,” says Paul. So they put the angle gauge on the fence and made it easy to see while you are adjusting it. We’re not perfect either. It was suggested that we be run through this jointer to sharpen our edges, but instead we wanted to clarify a few things. 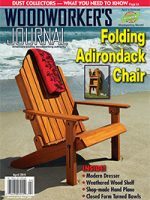 In the last edition of the print edition of Woodworker’s Journal, this jointer was part of a tool review where it was compared to other 6″ jointers. We got a few facts wrong. First off, we wrote that both Ridgid and Grizzly have orange plastic covered knobs that provide a great grip. Upon further examination, only Ridgid had these orange knobs. We also wrote that “the only positive stops on the fences are at 90 degrees,” when in fact the Ridgid jointer has positive stops at 45 degrees, 90 degrees and 135 degrees. We’re positive. Finally, we wrote that the dust collection hook up impedes chip extraction if you don’t use it with a vacuum system. Apparently if you don’t use a vacuum system, you only need to slide the ejection port out of the way and the sawdust chute is then completely exposed. In fact, Paul says they made an effort to make that chute easy to move out of the way in response to customers’ feedback. So please don’t run us through a jointer.